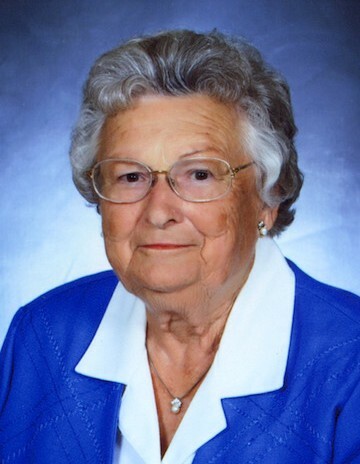 Stella M. Ewald, 93, a resident of Dahlgren, Illinois, passed away Saturday, March 23, 2019 at the Hamilton Memorial Hospital in McLeansboro, IL. She was born September 6, 1925 in Belle Rive, IL, the daughter of Benjamin and Margaret “Maggie” (Miller) Hutchcraft. Stella was a home maker and was a member of the St. John Nepomucene Catholic Church in Dahlgren and the St. Ann Altar Sodality. Stella is survived by one son, John (Debra) Ewald of Dahlgren, IL; two daughters: Shirley Biggerstaff of Norris City, IL and Sharon (Dean) Roesch of Mt. Vernon, IL; six grandchildren: Leslie (Chris) McManus, Allison Remley, Shannon Colson, Sharla (Jerrod) Barton, Sheila (Dan) Russell and Michael (JoAnna) Roesch; nine great grandchildren and several nieces and nephews also survive. She was preceded in death by her parents, husband, Clarence Ewald; and two sisters: Ruby Bell and Marguerite Ewald. Funeral services will be held Monday, March 25, 2019 at 10:00 a.m. at St. John Nepomucene Catholic Church in Dahlgren with Fr. Slawomir Ptak officiating. Visitation will be Sunday, March 24, 2019 from 5 to 8 p.m. at the Gholson Funeral Home in Dahlgren with a Rosary service at 7:00 p.m. She will be laid to rest at the St. John Nepomucene Catholic Cemetery in Dahlgren. Memorial donations may be made to St. Jude Children's Research Hospital or the National FFA Foundation and will be accepted at the Gholson Funeral Home in Dahlgren.